DIY Spice Jars: Update your Kitchen with Cute! 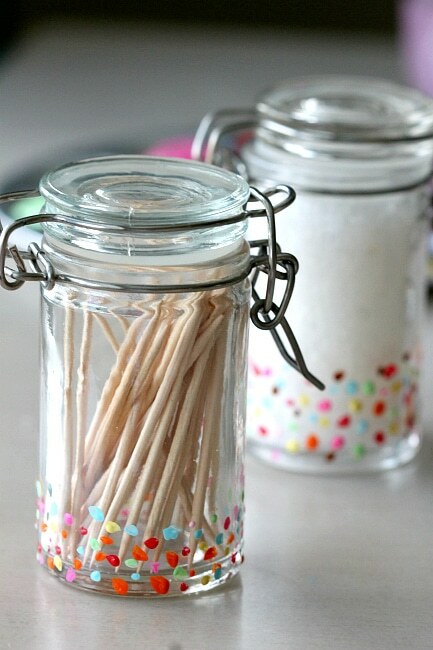 Home » Crafting » Jars » DIY Spice Jars: Update your Kitchen with Cute! I have a boring kitchen. A clean kitchen…but a boring one. I have a large space but it is long in length and really difficult to pack much decor around my massive bar style table. That means when it comes to decoration I really have to up my game. And this week after listening to hoards of decoration ideas from my friends (and feeling even more sad about my white and dull space), I decided that if I cannot create the kitchen of my dreams, I could up my kitchen cuteness by refreshing and customizing the tiny items as showcase pieces. If you are in the same boat as I am or you are ready to start on the road of your own DIY projects, this may be a good start for you! In addition to this being a fun craft that just about any age can complete, the style will be uniquely your own. As a bonus, its super inexpensive! This is super easy! 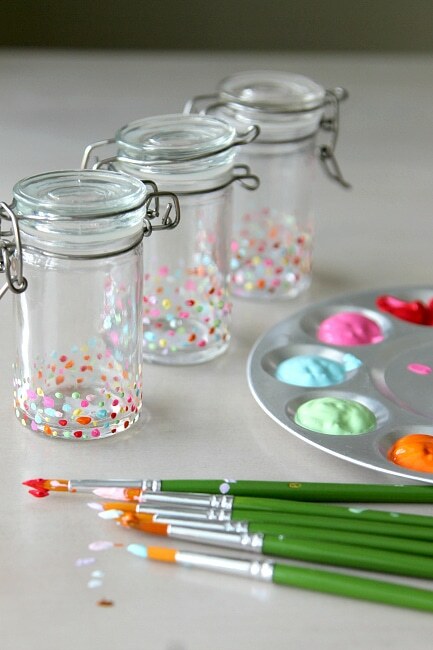 Just dot on in different patters your pain colors on the bottom of the jars. That is it! I love doing my own jars because they bring in a bit of whimsy in a popular style for your kitchen. 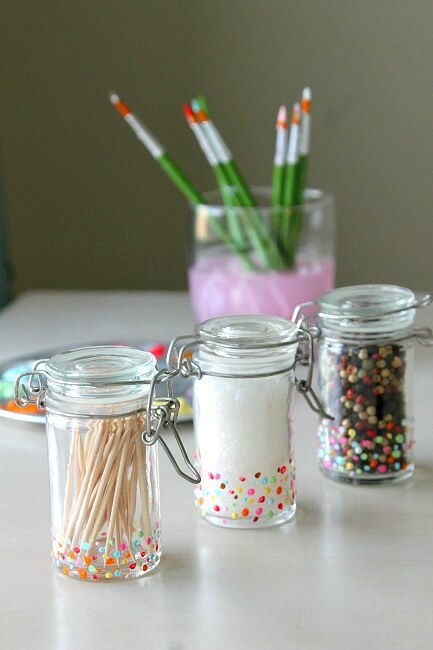 Plus for the items that often come in bags or boxes you can create jars to hold and display them. Take for example my sea salt and toothpicks. They were in a box and a bag…ugly. Now they are out and ready to be used! Btw, just to bring you in my home for a minute…here is my kitchen space! It’s a work in progress. « Young Living Shampoo Review: Did it work? Trisha I LOVE that kitchen table. Very fun! I think my daughter would enjoy helping me with this fun craft! Thanks for sharing this at The Wednesday Roundup this week. I’ve never thought to transfer spices to cute little jars. I’ll be checking out the craft store for cheap jars next trip! BTW, I love that dining table! Thanks Christine for stopping by. I love my table too but its full of paint and hot glue. I finally bought a new one (for the kids) that is much less pricey and much smaller so I can stop ruining this one! I love this! I need to jazz up my kitchen with some color. Darker brown, beige and cream color. It’s just blah. I love the colors you chose 🙂 I think crafts like this are such a great idea because they let your personality shine in your kitchen, it can be done super quick AND it doesn’t cost very much. Thanks for the adorable idea Trisha! Love these! Thanks for sharing! Our kitchen needs a major makeover. I was looking at these spice jars online at World Market. They also have neat wired racks that hold these. What a simple yet cute idea! Very cute way to dress up your counter space! Those are adorable! I’ll have to make some to brighten up our kitchen. I bet I could even get hubby to make me a shelf to put them on! This is such a cute way to bring colors into the kitchen! These are so cute. If I was crafty, I might try them myself. Maybe you should sell some. I would buy them!